This week much of the world is, like I am, watching the Olympic games in Rio. It seems like every Olympics has its own problems and scandals (doing something wrong that causes the public to have strong negative reaction). But somehow, when you actually start watching the athletes compete, you forget about all of that and just enjoy the magic of our fellow (similar to us) human beings doing some really extraordinary things. My favorite sport to watch is gymnastics, perhaps because my father was a gymnast (a person who competes in gymnastics) when he was in high school and so he loved watching those events on television. 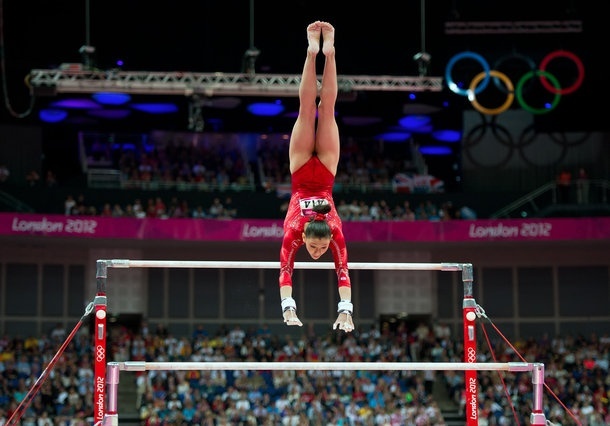 Gymnastics involves lots of different activities, including swinging on the uneven bars (see photo) and moving and jumping on top of a balance beam (a long piece of narrow wood about four feet (125 cm) off the ground). Lucy described some of the more popular sports during the 2014 Sochi Games, so I thought I would talk a bit about the two “new” sports for this year’s games, sports that are actually returning to the Olympic games after a long absence (time away from something). Golf is returning to the Olympics after being dropped (removed) after the 1904 Games in St. Louis, Missouri. We spoke about golf briefly here, but as you probably know, it is a game that uses long sticks called clubs that are used to hit a small ball (called, logically, a “golf ball”). The ball is placed on a tee, a small piece of plastic or wood that holds the ball up in the air, a few inches from the ground. The object (purpose) of the game is to hit the small balls into a hole that is located several yards from where you begin hitting the ball. The other sport returning this year after many decades (a period of 10 years) is rugby. Rugby is not popular in the United States, and I would guess that most Americans have never even seen a complete game of rugby (that would include me). From what I understand (which is very little), it involves a bunch of men and women (but not together) running around a field with a ball that looks like an American football. From the photos I’ve seen, it seems like there is a lot of hugging (people putting their arms around each other), but I could be wrong about that part. Technically, there are different kinds of rugby: the one being played in this Olympics is called “rugby sevens” since there are seven players on each team who play for periods of seven minutes. If you want to know more, don’t bother asking the average American, who I’m sure doesn’t know any more than I do. What are your favorite sports to watch in the Summer Olympics? This entry was posted in News and Current Events. Bookmark the permalink. According to some ratings of TV watchers one of the sports with more share is beach ball, specially when women are at play. Wives are fed up with husbands staring at screen as if it was their favourite baseball team was playing finals. I was surprise watching the iranian women team playing against the Spaniard girls, while these were wearing the standard bikini with total free-movement, the iranian girls were wearing clothes from feet to the head, and this covered by a tight scarf. So weird that really shocked a lot of this huge legion of the unconditional supporters this sport discipline really have. Today I surveyed my colleagues to see who’s watching these games. After that, just for curiosity, I checked the ratings online. I found some articles that confirmed my personal findings. It seems as though the ratings are around 30% less than the last Olympics which were held if I remember that correctly, in London. I prefer to practice sport myself, and recently I have been clocking up kilometres both pedaling and running. You can call me iron man if you want. 14th August final for gymnastic, waiting for that. Jeff, something new about you and your life being a boy, your father was a gymnast?. Always I thought he was a coach of some team like rugby or baseball, never I thought he was a gymnast. Having a father like him, what about you my dear friend?. being with the friends, but nothing more. with wealthy families, not for me or people like the one who lives my sourroundings. never he thought about sending us to the university. Thank you so much Jeff, I always read your post with so much pleasure. Incredible last gymnast were he won the gold medal just in this moment. of Serghei Rachmaninoff’s Piano Concerto No.2. I think this is valid for everyone of us. We have to take care of every our friendships, every old or new friend, keeping in touch with them. don’t make love just for fun. We can hurt someone very badly. Don’t wanna be, all by myself anymore”. I don’t want to be alone. Thank you for the explanation of the phrase” I am by myself”. These days , from personal reasons, I am feeling alone. No, I don’t want to be by myself. But I like to be on my own. I’ve never heard about “Puff the Magic Dragon” song by Peter, Paul and Mary. I have listened it on You Tube. It is nice , just for children. Instead, I remember of Piff-Puff, the 80’s French magazine for children from my country. No way of “puff” with the meaning of “to smoke marijuana”. We did not know this phrase as children. I do not watch the Olympic games in Rio. But my favorite sport to watch is gymnastics as we were the best in the world many years ago. in the uneven bars, and was awarded a score of ten. Because the scoreboard only allowed three digits, it had to display her score as 1.00. This led to total confusion, until the announcer informed that she had score a perfect ten. Nadia Comaneci scored a total of seven 10s at the 1976 Olympics, four on the uneven bars and three on the balance beam. First perfect ten in the gymnastics history. Thank you for telling us about the new sport to me called “rugby sevens”. I have just seen on TV the headline, rugby sevens gold is Fiji’s first-ever olympic medal. I think that your new friend from Italy is our dear blog friend, Dan, an extraordinary man. “One of the best things a man/woman could have it is only to have at least ONE real friend… sometimes it is enough. I think that one of your best friends is our dear teacher, Jeff. Yes, Jeff is a wonderful man with a gold voice, a great teacher , and a very good friend. Maybe you have forgotten me. I think about you like a dear blog friend. Ja, ja, ja, Tania, you make me laugh a lot, and that is very good for me now. Being so closed about you dear misterious friend Tania, it is difficult to create a strong bond of friendship. In fact we don´t know anything about our poet´s life. Could be that good? or not?. Who knows?. a lot with Cuca and other friends about you dear. Yes I love the idea I could have about you Tania, that could be enough, don´t you think so?. poor, I don´t know if you are single or married, I don´t know if you have children or not. More or less like Lucy for every one here in the blog, our misterious dear teacher. of person he is, and what is the life he loves. his age, and of course everybody here loves him because his is an excelent person in all ways. Not to talk about English best teacher. persons I have met along my life. came home to pick me up and we went to see Cuca. industrial enginering, he follows but I gave up. That´s all my dear Tania, you will be always in my mind as the misterious girl or woman friend of the blog. I think it is enough for today. bye friends. Well ,it is Olympic we are talking about. Typically , a lot of people plug in to it ; some even become obsessed. I like track and field and swim competitions. However , I don’t think it is the actual Olympic Games and scores we should bring to the spotlight but a lot of controversies that are brewing around Rio Olympic 2016.some we hear about it throug media outlets ; some just slip through media scrutiny. I was looking for ur name to read what u have to say about what is really happening just a few steps away from all the guady and glory. But , I must say I m surprised thst u Seemomgly ,decided to sit on the sideline. U r down there my good friend observing what is actually going down as Rio Olympic progressing , unfolding some might say. I hear people are not happy with the fact that the government has spent milion of dollars in Olympic preparation ranging from upgrading to Restiration while ignoring the pressing needs of the majority to welfare and education and health. I hear,every day ,not far from the dolled up arenas , people take to streets to voice their complaints against the government overspending on Olympic while there a lot of poverty-stricken people _In hard hitting neighbourhoods not far away from Olympic glories _are suffering through for it.